First Nations leaders say the occupation of Premier Christy Clark’s constituency office is over because the government has agreed to talk about the spread of treated human waste on private and public lands in the Nicola Valley. 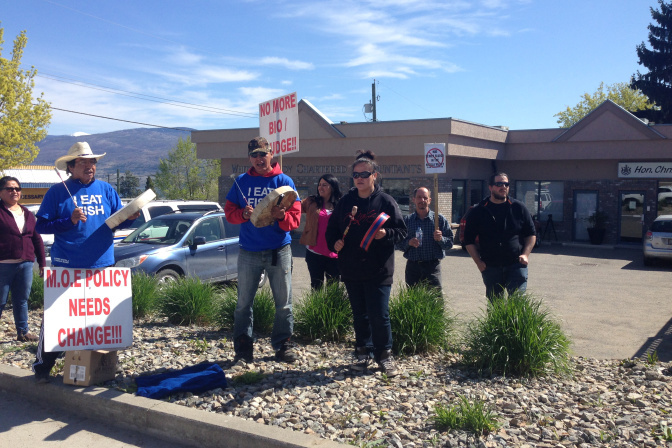 Four chiefs and a representative from a fifth First Nation began their sit-in of Clark’s West Kelowna office on April 15. At the time, Chief Aaron Sam of the Lower Nicola Indian Band said leaders had met Environment Minister Mary Polak twice and asked her to disclose where the waste was being spread, but the government only provided a partial list. The leaders said they were worried about impacts on land, water, traditional foods and health, noting the government is legally obligated to consult with aboriginals. But the chiefs issued a news release late Monday afternoon, saying the government has committed to a high-level meeting to resolve their ongoing concerns about biowaste operations. The company contracted to spread the waste, BioCentral, has said biosolids are used around the world to rejuvenate soil, and it had all the required permits, licences and permissions. “It is time to move forward with resolving this issue on a government-to-government basis,” said Coldwater Band Chief Lee Spahan. The leaders say they want the province to collaborate on a process to gather and share information about biowaste, manage and address impacts, and protect lands and wildlife in the valley. Posted on April 21, 2015, in Uncategorized and tagged bio-solids, Biocentral, Kelowna, Native occupation, native protests, sewage. Bookmark the permalink. 1 Comment.